Results: Bayley defeated Alexa Bliss; Mustafa Ali and Jack Gallagher defeated Brian Kendrick and Drew Gulak; Finn Balor defeated Elias Samson via DQ; Arya Daivari defeated Akira Tozawa after Titus O’Neil stopped the match; The Revival defeated The Hardy Boyz; Roman Reigns vs. Samoa Joe ended in death by Braun Strowman. Considering that one of the major highlight’s of last week’s Raw was its inspired bit of memory-fueled storytelling, with Ambrose refusing to trust Rollins in any capacity, it’s great to see the show go back to that well immediately this week. The top of the show sees Ambrose come out to the ring and immediately challenge The Miz and the Miztourage to a fight. He doesn’t get them though. Instead, he gets Rollins telling him that he’s confused about Ambrose’s allegiances right now, unsure if he’s standing with him or if he wants Rollins out of his business. What follows is more great character work revolving around Rollins’ betrayal of Ambrose and The Shield. It’s a complex bit of business, as both men have reasons to want to dwell on and move on from the incident. Ambrose, like a jilted lover, lays out how he once trusted Seth, and how he’s not sure it can be earned back. To his credit, Rollins apologizes and says he’s ready to move on. It’s all pretty moving, and it’s the kind of talk that should have happened much earlier in Seth’s babyface run…which also makes it the perfect time for the Miz to interrupt and have his cronies lay a beating on each of the former Shield members. Before the Rollins-Ambrose-Miztourage segment, the show’s opening video package is focused solely on Kurt Angle and his big announcement set for later in the evening. It’s a great tease, and a smart way to kick off the show, immediately addressing last week’s cliffhanger and giving people a reason to stick around. More on that later. I’m a little conflicted when it comes to how I feel about the current build to the Raw Women’s title match at Summerslam. On the one hand, I like the idea of pitting Bayley and Sasha Banks against each other, as that’s a relationship that could use some conflict. On the other hand, I feel like WWE is moving through the same storytelling beats and becoming complacent. Nia Jax is still there as Bliss’ bodyguard despite her assertion that she wanted a title shot. Bayley and Banks are still best buds, and tag matches, or at least some form of match with multiple superstars getting involved, are the norm. As tonight’s match proves, these women can work wonders when given a little time in the ring; there’s great chemistry in any combination of Bliss-Banks-Bayley. Hopefully Banks and Bayley get a good chunk of time next week in their match to determine who will face Bliss at Summerslam for the title. Is there a single person out there that finds the Cruiserweight division interesting? Is there someone out there just absolutely enthralled by Brian Kendrick dressing up as Jack Gallagher? Is anyone watching 205 Live every single week? I ask because while much of the division is talented, and there are a fair amount of good characters—Neville, Tozawa, and Gallgher spring to mind—it’s hard to see how they fit into Raw. Every single one of their matches on the show has a storyline tie-in with 205 Live, and yet I get the sense that most folks aren’t watching the show (and I know I’m not). That means the only reaction to the matches, which hardly ever feel like true high-flying Cruiserweight matches, is indifference. It looks like Finn Balor could be headed for a Summerslam bout with Bray Wyatt—that would explain Bray’s clean win over Rollins, because he always snags a big win before he’s set up for a PPV loss—but for now he’s stuck in Elias Samson purgatory. 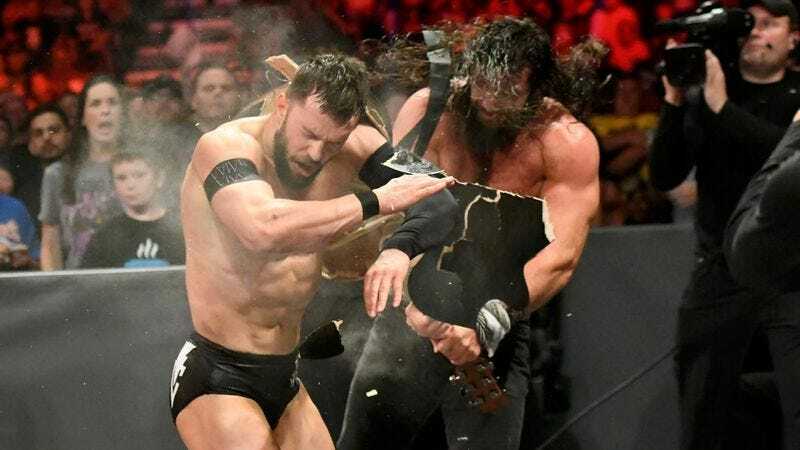 They have a rematch this week, and next week they’re scheduled for a No DQ match after Balor takes a pretty brutal guitar shot to the head. While I wish Balor was doing a bit more on the roster, I like what this feud is doing for both guys. Balor is building babyface momentum by going up against the guy nobody likes, and in turn Samson gets to showcase his mean, nasty side. Finally, in the show’s second hour, we get the answer to the question that everybody’s been asking: just what is Kurt Angle hiding? Considering the loving tone of his mysterious phone conversations, there’s been a lot of speculation about a potential love interest; I saw everything from Vickie Guerrero to Stephanie McMahon floating around out there on the internet. The real answer is somehow tamer and yet equally absurd. Angle comes out to the ring and informs everyone that he recently learned his college girlfriend gave birth to a child nine months after they stopped dating, and that said child, after exceeding in school and athletics, set out to be a WWE Superstar. Now, with great pride, Angle is ready to welcome him to the Raw roster and embrace him as his son. That child? Jason Jordan, formerly (I presume) of American Alpha. It’s so silly, but I can’t say I don’t like it. It’s the kind of pro wrestling nonsense that Angle’s sold in the past, and his commitment here, tearing up as Jordan comes to the ring and gives him a hug, has me sold. On top of that, I’m very curious to see how Jordan and Gable fare as singles wrestlers. They’ve each been set up with a great amount of confidence, with Jordan getting the Angle connection and Gable getting to show his stuff against AJ Styles in an open challenge, so clearly WWE still thinks the world of them. Here’s hoping they manage to connect with the crowd over the next few months, and that both Raw and Smackdown! Live have plans in place for them. It is so nice to have The Revival back. I really missed watching those guys work a clinical tag tam match. With Angle’s secret out in the open, Raw shifts its focus to the other big story of the night: the showdown between Roman Reigns and Samoa Joe to determine who will face Brock Lesnar for the Universal Championship at Summerslam. The match itself is a true slobber knocker, with Reigns and Joe beating the hell out of each other. What’s remarkable is that while just about everyone knows what’s coming, the match doesn’t need the appearance from Strowman to be a success. Don’t get me wrong, Strowman a bonafide star and deserves to have his spot at Summerslam, and I’d even go so far as to say there’s no reason to not put the Universal Championship on him. It’s just that Joe and Reigns have been built so beautifully as contenders that the match stands alone as a brutal, compelling, exciting fight to determine the #1 contender. That said, Strowman continues his brutal brilliance here. Both Reigns and Joe get their shots in, but Strowman walks out of the arena as the one making a statement. It looks like we’re headed to a Fatal Fourway for the title at Summerslam, and while I’m usually more of a traditionalist, enjoying singles matches for the titles at major PPVs, I can’t argue with the logic here. For months now Raw has put in the work building up its main event scene, and Summerslam is looking like it’ll be quite the payoff.